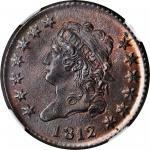 1793 Liberty Cap Cent. S-13. Rarity-4-. AU-55 (PCGS). CAC. 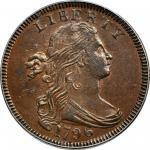 Among early large cent design types and dates the classic rarity and showpiece is the 1793 Liberty Cap. 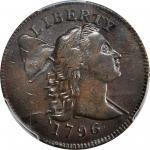 This is the first iteration of a cent design that would become classic in that series and extend through 1795. Not often to we have the chance to showcase a high-grade example, much less than one with a pedigree that includes a Who's Who roster of outstanding figures in this specialty. One of the great pleasures of professional numismatics is the opportunity handle the same coin multiple times, usually over a long stretch of years. With some regularity, including in the present Rarity Night sale, we reoffer coins that we sold in the Major Lenox R. Lohr Collection in 1961. Coins from the Garrett, Eliasberg, Norweb, Bass, and other of our sales have become old friends as well. With our recent series of five sales of the D. Brent Pogue Collection, likely many of the coins will go into hiding and not reappear for decades, if ever. 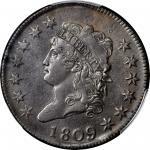 There are some scattered exceptions, such as with the buyer of the present coin who has changed directions and has consigned it to us for the Rarities Sale. Nice to see this landmark again! 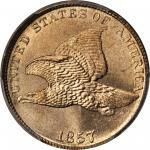 The present example from the Sheldon-13 dies has long been considered to be among the coins that emerged from the Brand Collection in the early 1940s, perhaps the one invoiced by Burdette G. Johnson to dealer James P. Randall on April 18, 1944, as "1793 Liberty Cap, Crosby 12-L. Unc., light nick on edge" for $360. 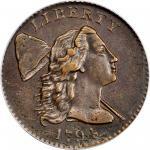 Three years later, B. Max Mehl's sale of the Frederic W. Geiss Collection included two high grade examples of the 1793 Liberty Cap; only lot 10, the first of the two lots, was illustrated, and the photograph was of the Atwater example that was safely ensconced in the Eliasberg cabinet at the time. (This was the era in which several firms used "stock" illustrations in their catalogs -- often not of the actual coin being sold.) Lot 10 was described as "purchased by Mr. Geiss as Uncirculated" but showing "the very slightest cabinet friction" with "medium light even light brown surface, slightly glossy." 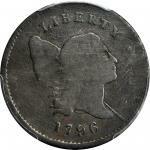 It realized $400, in line with the Brand-Johnson-Randall coin sold in 1944. The following lot was noted as being "from the famous Dr. Hall Collection of Boston, also of the Virgil Brand Collection of Chicago," further described as "almost as choice...another specimen which Mr. Geiss purchased as Uncirculated." It was lauded for being "boldly struck even on the center of reverse," which Mehl rightly pointed out is "usually weak on this variety." The color was described as "attractive and nicely blended medium olive." It sold for $250. Considering this example's light color, and slight typical softness at the central reverse, it is more likely to be lot 10 from the Geiss sale than lot 11; neither is provable in the absence of further evidence. On either side of the Virgil Brand divide, severed connections are difficult to knit back together with certainty without photographic evidence. 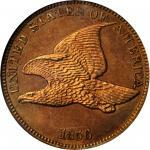 This coin's provenance since the late 20th century includes several memorable auctions and well known collectors. Even in an historical vacuum, this cent stands out as one of the most attractive of its kind. 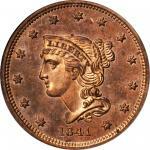 In addition to a long list of other attributes, this coin is a PCGS Registry Set candidate. 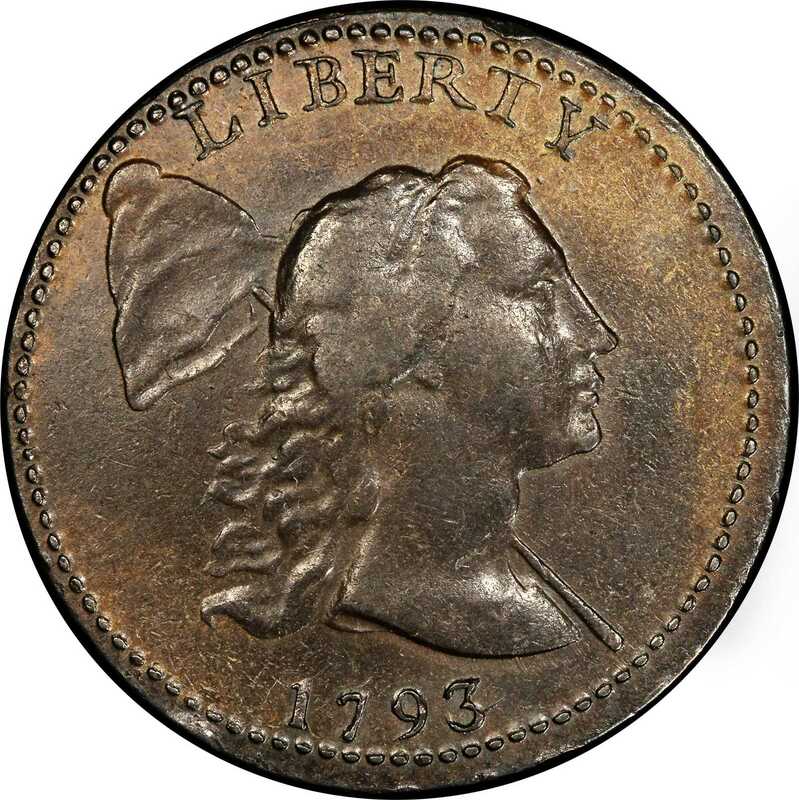 Lovely tan color covers most of the reverse, along with the upper obverse and the right obverse periphery, while steely chocolate brown patina embraces the portrait of Liberty and the lower obverse. Nearly smooth with good gloss on both sides, this 1793 Liberty Cap cent retains some suggestions of lustrous frost among the reverse intricacies. Scattered light marks are seen on the obverse, many of which pre-date striking. A dull mark on Liberty's cheekbone that is nearly invisible is the most individually severe of these; a short scratch is seen at the right side of the digit 3 in the date. Several rim nicks and bruises are present, including one above the left side of the letter T in LIBERTY, one left of the letter O in OF on the reverse, another above the space between the letters ER in AMERICA, and others that are less evident. The eye appeal is superb, enriched by the fine color and nice surfaces, despite the presence of minor wear. This example is struck from a somewhat later state of these dies with a more developed bulge at the bases of the letters NT in CENT. The lapping lines directly above the pole in the space between the cap and Liberty's hair are not present, though light fatigue lines outline Liberty's portrait around her forehead and below the bust truncation. A thin die crack or fissure in the die face extends into the field below the upright of the letter L in LIBERTY. Some raised lumps in the same vicinity, particularly below the space between the letters IB in LIBERTY, are the result of spalling, a process by which tiny chips fall off the face of the die. Among the most problem-free of the high grade 1793 Liberty Cap cents extant, this coin ideally showcases the Liberty Cap design of Joseph Wright. As a 26-year-old portrait painter studying in London, Wright was dispatched to Paris to paint Benjamin Franklin. He spent much of the first half of 1782 in Passy, the Paris suburb that served as Franklin's home in France. In March 1782, Franklin conceived a medal that would have an enormous impact on the future of American coinage and the numismatic legacy of Joseph Wright. On March 4 of that year Franklin wrote to Robert R. Livingston, who had served with Franklin on the committee to compose the Declaration of Independence: "This puts me in a mind of a medal I have had a mind to strike, since the late great event you gave me an account of, representing the United States." A year later, Franklin's brainchild would be realized, and the Libertas Americana medal engraved by Augustin Dupre would become a sensation in Europe and America. Joseph Wright left Paris while the medal was still in its design stage, but its impact on his later works is clear. 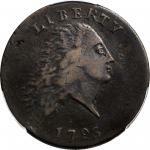 His Liberty Cap cent of 1793, the first of which were struck just a day before the 1793 half cents that displayed a similar design, copied the obverse of the Libertas Americana medal almost exactly. 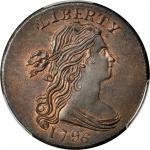 Franklin's official explication or description of the medal, published in Paris in May 1783, describes the obverse portrait: "the head representing American Liberty has its tresses floating in the air, to show that she is in activity. The cap carried on a spear is her ensign." The cap, of course, is the Liberty cap, a stylized version of the pileus of classical times, a powerful symbol of freedom that was commonplace in England and America even before the American Revolution. Many, perhaps most, of the leaders of the American Revolution were given examples of the Libertas Americana medal. Jefferson's was displayed in a frame at Monticello and described in his inventory of art as "a medal by Doctor Franklin." Washington's, struck in silver, was housed in a sumptuous box that contained a set of medals struck in France to commemorate the Revolution. If Wright did not own one personally, the odds are good that others in his circle did, likely including Mint Director David Rittenhouse. 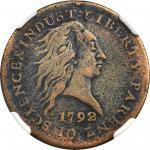 Joseph Wright's relationship to the United States Mint began even before coining did. 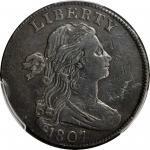 He is known to have produced two works before his final project, the 1793 Liberty Cap cent. Their sequence is not known. 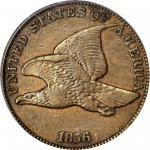 Wright's 1792 "Eagle on Globe" pattern was almost certainly produced as an essay for the quarter dollar denomination and is an extreme rarity today though examples are known in both copper and white metal. His medal for Henry Lee was the last entry into the Comitia Americana medal series, composed of medals authorized by Congress to be presented to military leaders of the Revolution. While all others were engraved and struck in Paris in the 1780s, the Lee medal was somehow neglected. The obverse for Wright's portrait medal of Lee cracked in hardening, and strikes from his original dies are so rare today as to be entirely uncollectible. 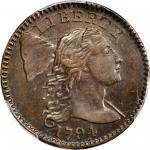 Both of these efforts preceded his 1793 Liberty Cap cent, of which four obverse and two reverse dies were produced. Research by Bill Eckberg, published in Penny-Wise in September 2010, has shown that the 1793 Liberty Cap cents were struck on July 18 and July 22, indicating that the dies must have been executed some time earlier. (A nod goes to Bill for all of the incredible research he has done over the years; we are all the beneficiaries.) The fruits of the Mint's labor for those two days amounted to 11,056 cents, representing the sum total of the 1793 Liberty Cap cent production, all delivered to the Mint's treasurer on September 18. By the day they were inspected, counted, and turned over for distribution, Joseph Wright was dead, a victim of the plague that turned Philadelphia vacant during the late summer doldrums for years into the early 19th century: yellow fever. "Joseph Wright being very ill and not expecting to recover, requested the subscriber to make a memorandum as follows: that the said Joseph Wright had presented an account against the United States for cutting a medal, amount fifty guineas. Two essays of a quarter dollar, cut by direction of David Rittenhouse, Esqr. and presented to him (broke in hardening) value about 40 guineas." On December 31, 1793, Thomas Jefferson closed the book on Joseph Wright's career with the Mint officially, issuing an order that asked for "Wright's representatives to be paid for engraving the medal of Govr Lee and (that being broke in hardening) another to be engraved." Yet, his artistic concept of Liberty lived on. The Liberty Cap design persisted on cents through 1796 (and most other denominations, sans cap), when the French association with the Libertas Americana apparently became too politically poisonous for the design to continue. PCGS# 35489. NGC ID: 223L. 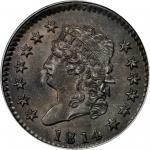 PCGS Population (all die varieties of the 1793 Liberty Cap cent): 3; 3 finer, 2 of which are Mint State (MS-64+ BN finest). Provenance: Ex Rodney T. Grove Collection; Robert Nofal and Lewis Kling; Superior's session of Auction '81, July 1981, lot 509; Denis W. Loring Collection; Herman Halpern Collection, by sale, July 1985; our (Stack's) sale of the Herman Halpern Collection, March 1988, lot 15; David Bloom Collection; John B. MacDonald Collection; Denis W. Loring; Jon Alan Boka Collection; Heritage's sale of the Al Boka Collection, September 2011, lot 3003; Cardinal Collection; our sale of the Cardinal Collection, January 2013, lot 13003, via Richard Burdick; D. Brent Pogue; our (jointly with Sotheby's) sale of the D. Brent Pogue Collection, Part V, March 2017, lot 5091.